grandma's cookie jar: Two Tasty Christmas Gift Ideas You Can Make! Two Tasty Christmas Gift Ideas You Can Make! If you are looking for a gift idea which is easy and inexpensive to make, yet ends up being a really great gift, check these two ideas I found on Pinterest this morning! 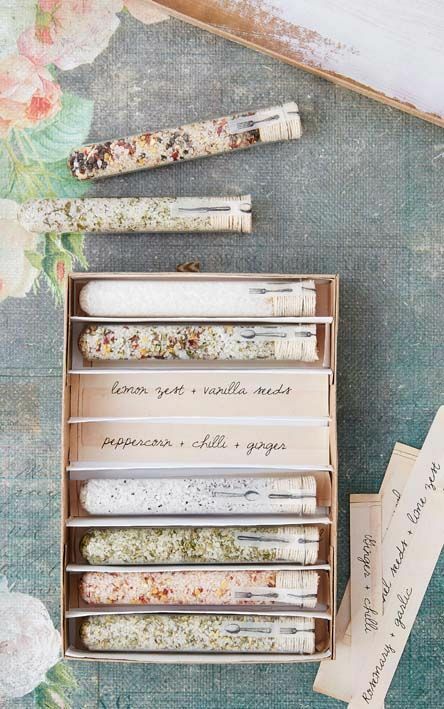 The first gift idea is for a set of seasoned salts which you make and then wrap in individual containers for a lovely, classy and very usable and tasty gift which is fun to make and give and great to receive! If you follow this link you'll find all the details for making your own seasoned salts! If you have a cook on your gift list, this is a great gift to give them! The second gift idea is similar; it is for a set of dip mixes you make and wrap for another lovely, classy and very usable - and tasty gift! This link will give you all the details and recipes for making your own set of dip mixes, so again, if you have a cook on your gift list . . . or someone who doesn't like to cook, but who would love a set of mixes which they can simply add to sour cream for a great dip - this is the perfect gift for them! I love both of these ideas - what do you think? Are these gift ideas you might try? I Have a Winner & One more Give-Away in Two Days! Tired, but Oh, So, Blessed! crafting with grandma - Crocheted Monster Hats! fun with grandma - Ten Thanksgiving Fun Ideas! crafting with grandma - Bead Ornaments! Christmas Treat - a Free Game!